Spending time on your Android phone can be a lot of fun while you enjoy the most beloved sports apps. This implies the fact that these apps are the best on the market and people love them so much they are willing to download them over and over again. Their value resides both in the way they are designed and in the joy the users feel when they get the information they want. In this respect sports applications will offer a large array of data for favourite sports from a large palette of choices. The necessary thing is to simply have a smartphone with Android and an account for downloading them straight to your personal cell phone. The promise of ESPN app is to bring a full reporting website on your personal cell phone. This means that your Droid will be connected to the most powerful tool of statistics in national sports. The best thing is yet to come, as all the information presented on the website is given to the users free of charge. In this way people know that they have a handy tool to use whenever they feel like. The famous widget known as Bing Sport uses the search engine Bing and brings in data really quick as being powered by Bing it has access to servers all around the globe. It is a relevant way to bring data in and to find whatever you may want in the sports field. Through the usage of Bing, the app guarantees a swift interaction between the user and the database. The NBA League Pass Mobile is ideal for all basketball fans. It offers an exciting and unique experience as it gives the possibility of watching over 1000 games during the basketball season. Also after the finishing of each game, there is a replay ready to be watched at a convenient time. The sports app keeps in short reach live score updates and statistics required by the fans. Having the reputation of being on top of the sports apps, SportsTab has a rich user interface which allows minute by minute updates in all the sports one may select. Also if you do not want to miss the start of a certain game, there is the option to receive alert beforehand. If your favourite team is not in the first leagues, you will have the chance to stay updated with results from lower league teams. In this way, free of any charge, you are free to keep in touch with all sorts of events. The Sky Sports News Widget is bound to give updated scores for the major sports in this field of interest. 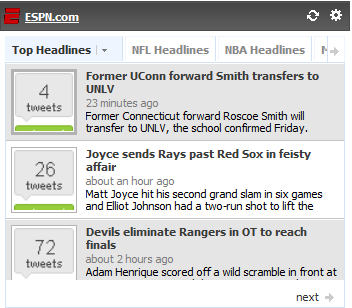 Also without any charge it gives a series of notifications over the news and highlight reels in the selected sports. For a great accessibility, an icon of the app is place on the Android homepage. The top sport apps have earned their title by offering the customers a full experience of the sporting world. These apps are now on the billboard of Google Play and it will take a lot of time for other sports apps to get their high ranked place. Author Bio : Adam is a tech and sports enthusiast and never misses any major sports event.In his free time apart from playing with gadgets and watching ESPN he does some sports betting with Bet Victor.Bet Victor is a leading sports betting organization.